In a world of food bloggers, #foodporn hashtags and self-proclaimed “foodies”, we can make a pretty obvious link between dining and social media: People love sharing what they’re eating, and they especially love to do so on Instagram. In fact, there is perhaps no better industry that Instagram is geared towards than the restaurant industry, and the use of Instagram as a means of social media marketing has changed from a nice option to an absolute necessity. Restaurants are using this free marketing technique to engage with customers, promote new menu items and gain new fans. Here’s how you can use Instagram to consistently grow your followers and increase sales. The first thing you should do before starting your Instagram marketing journey is to create an Instagram Business Account. Doing so will allow you to get access to Instagram’s analytics tools (called Insights) where you can see stats for your content. A business account will also increase the chances of your content getting seen by your followers in their news feeds as well as allow customers to contact you directly through Instagram. Even if a user doesn’t follow you on Instagram, they may follow you on Facebook, Twitter or LinkedIn instead. By focusing on cross-promoting, you’ll be able to generate more exposure to your Instagram content, increase views and gain followers. Successfully overlap Instagram with all of your social media accounts by sharing your Instagram posts on Facebook and Twitter and utilizing Instagram’s embed feature on your website. The user-friendly web embed lets you copy and paste your post’s code to effortlessly place the image on your website. Not only will your customers be able see the image, they’ll be able to click on it and be redirected to your restaurant’s Instagram page. There are two free tools available on Instagram that opens up a world of marketing and social media opportunities. The first, Instagram Stories, is a Snapchat-like feature that allows users to post photo or video content with a shelf life of just 24 hours. It’s ripe for digital marketing opportunities for restaurants and bars: You can add live links and direct followers right where you want them, tag other accounts, add location information and hashtags, and be found by a wider audience. The second, Instagram Live, is an equally – if not more important – feature that will help you grow your brand. Instagram’s live streaming feature drops the corporate veil and connects your brand with users in a friendly way. Live video is urgent and interactive, and can be used to cover events, live Q&A sessions or to just show customers a new dish or drink. You’ll be able to see who is viewing your Live video and engage with fans then and there. Get people talking! Post a weekly picture where you ask your followers to “caption this”, ask customers to name a new dish or hold a monthly contest and get fans to tag who’d they share their winnings with. Reposting, or “regramming”, on Instagram can be an excellent addition to your marketing strategy. And there are plenty of ways to do it. To Regram, look for great shots of your restaurant using your geotag or hashtag. Once you’ve found the photo you want to share with your followers, the most straightforward option is to manually Regram. Take a screenshot of the image you wish to share and save it to your phone. You’ll need to crop out everything but the image, post it onto your Instagram page and credit the user. The second option is to use an external Regramming app. The most popular is Repost For Instagram: It’s free, connects directly to your Instagram account and even allows for video Regrams. This tactic helps you promote branded and user-generated content. You’re building major brand loyalty with that customer by highlighting their awesome photo and helping to boost engagement at the same time. Make yourself searchable by tagging posts with hashtags to increase your search-results. Key hashtags to include are your restaurant name and a signature dish or drink name (i.e. #burger and #longislandicedtea). Start typing into your search bar and look for hashtags that will get you serious organic views, but not so many that your post will be buried in the other 85 million #foodie posts. For example, specifying by location: i.e., #nycfoodie (678,000 posts) rather than #foodie (85 million posts) will generate more impressions from people in your area, rather than those on the other side of the world who have no intention of ever coming to your restaurant. Instagram posts with at least one hashtag average 12.6% more engagement than those without. Take photos of any new menu items to inspire regulars and newcomers to try the items. Are you offering a new pizza topping, innovative cocktail or vegan options? Ask your customers to help you name it! By having customers join in the process, they’ll create engagement to your Instagram page. Gift the winner with a free sample of the new dish to encourage fan loyalty. 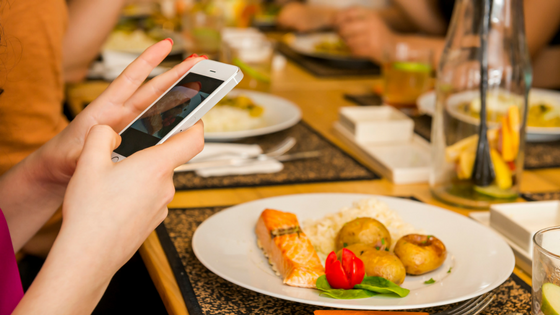 Encourage customers to share photos and add your restaurant tag to their posts. Ask followers to share their best photos of your restaurant and food with your business name tagged in the photo, hashtag or geotag. Offer winners gift cards, discounts or a free meal. If you can get a food blogger with a large following to post about your restaurants, you’ll reap the benefits of a huge amount of brand exposure to a relevant audience. Food bloggers are easily reachable and will often exchange their services for a plate of your best pizza, so never underestimate the use of one. Look for bloggers with 20k-50k followers – they have amassed a loyal following and usually come dirt cheap.